Ã ÃÂ½ÃÂ¸ÃÂ³ÃÂ° Ã‘ Ã‘ Ã‘ ÃÂ¾ÃÂº ÃÂ¿ÃÂ¾-ÃÂ°ÃÂ½ÃÂ³ÃÂ»ÃÂ¸ÃÂ¹Ã‘ ÃÂºÃÂ¸ ÃÂ¸ ÃÂ¿ÃÂ¾-Ã‘ Ã‘ Ã‘ Ã‘ ÃÂºÃÂ¸ contains 100 jokes in easy English and in Russian. 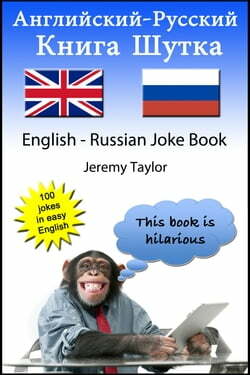 Great jokes... read more like:ÃÂ£Ã‘ ÃÂ¸Ã‘ ÃÂµÃÂ»Ã‘ : - Ã ÃÂ´ÃÂµ ÃÂ¶ÃÂ¸ÃÂ²ÃÂµÃ‘ Ã ÃÂ¾ÃÂ³?Ã ÃÂ°ÃÂ»Ã‘ Ã‘ : - ÃÂ¯ ÃÂ´Ã‘ ÃÂ¼ÃÂ°Ã‘ , ÃÂ¾ÃÂ½ ÃÂ¶ÃÂ¸ÃÂ²ÃÂµÃ‘ ÃÂ² ÃÂ½ÃÂ°Ã‘ ÃÂµÃÂ¹ ÃÂ²ÃÂ°ÃÂ½ÃÂ½ÃÂ¾ÃÂ¹.ÃÂ£Ã‘ ÃÂ¸Ã‘ ÃÂµÃÂ»Ã‘ : - Ã ÃÂ¾Ã‘ ÃÂµÃÂ¼Ã‘ Ã‘ Ã‘ Ã‘ ÃÂ°ÃÂº ÃÂ³ÃÂ¾ÃÂ²ÃÂ¾Ã‘ ÃÂ¸Ã‘ Ã‘ ?Ã ÃÂ°ÃÂ»Ã‘ Ã‘ : - Ã ÃÂ¾Ã‘ ÃÂ¾ÃÂ¼Ã‘ Ã‘ Ã‘ ÃÂ¾ ÃÂºÃÂ°ÃÂ¶ÃÂ´ÃÂ¾ÃÂµ Ã‘ Ã‘ Ã‘ ÃÂ¾ ÃÂ¼ÃÂ¾ÃÂ¹ ÃÂ¿ÃÂ°ÃÂ¿ÃÂ° ÃÂºÃÂ¾ÃÂ»ÃÂ¾Ã‘ ÃÂ¸Ã‘ ÃÂ² ÃÂ´ÃÂ²ÃÂµÃ‘ Ã‘ ÃÂ¸ ÃÂ³ÃÂ¾ÃÂ²ÃÂ¾Ã‘ ÃÂ¸Ã‘ : Ã‚Â«Ã ÃÂ¾Ã‘ ÃÂ¿ÃÂ¾ÃÂ´ÃÂ¸, Ã‘ Ã‘ ÃÂµÃ‘ Ã‘ ÃÂ·ÃÂ´ÃÂµÃ‘ Ã‘ ? !Ã‚Â»and this classic:Ã ÃÂ¾Ã‘ Ã‘ ÃÂ¼ÃÂ¸ÃÂ´ÃÂµÃ‘ Ã‘ Ã‘ ÃÂ¸ÃÂ»ÃÂµÃ‘ ÃÂ½ÃÂ¸ÃÂ¹ ÃÂ¼Ã‘ ÃÂ¶Ã‘ ÃÂ¸ÃÂ½ÃÂ° ÃÂ¿Ã‘ ÃÂ¸Ã‘ ÃÂµÃÂ» ÃÂ½ÃÂ° ÃÂ¿Ã‘ ÃÂ¸ÃÂµÃÂ¼ ÃÂº Ã‘ ÃÂ²ÃÂ¾ÃÂµÃÂ¼Ã‘ ÃÂ²Ã‘ ÃÂ°Ã‘ Ã‘ .- ÃÂ¯ Ã‘ ÃÂ¾ÃÂ±ÃÂ¸Ã‘ ÃÂ°Ã‘ Ã‘ Ã‘ ÃÂ¶ÃÂµÃÂ½ÃÂ¸Ã‘ Ã‘ Ã‘ Ã‘ ÃÂ½ÃÂ° Ã‘ ÃÂ»ÃÂµÃÂ´Ã‘ Ã‘ Ã‘ ÃÂµÃÂ¹ ÃÂ½ÃÂµÃÂ´ÃÂµÃÂ»ÃÂµ, ÃÂ´ÃÂ¾ÃÂºÃ‘ ÃÂ¾Ã‘ .- Ã Ã‘ ÃÂµÃÂ½Ã‘ Ã‘ ÃÂ¾Ã‘ ÃÂ¾Ã‘ ÃÂ¾,- Ã‘ ÃÂºÃÂ°ÃÂ·ÃÂ°ÃÂ» ÃÂ´ÃÂ¾ÃÂºÃ‘ ÃÂ¾Ã‘ . Ã¢ ÃÂ¡ÃÂºÃÂ¾ÃÂ»Ã‘ ÃÂºÃÂ¾ ÃÂ¶ÃÂµ ÃÂ»ÃÂµÃ‘ Ã ÃÂ°Ã‘ ÃÂµÃÂ¹ ÃÂ½ÃÂµÃÂ²ÃÂµÃ‘ Ã‘ ÃÂµ?- Ã ÃÂ¾Ã‘ ÃÂµÃÂ¼ÃÂ½ÃÂ°ÃÂ´Ã‘ ÃÂ°Ã‘ Ã‘ Ã¢ ÃÂ¾Ã‘ ÃÂ²ÃÂµÃ‘ ÃÂ¸ÃÂ» ÃÂ¼Ã‘ ÃÂ¶Ã‘ ÃÂ¸ÃÂ½ÃÂ°.- Ã ÃÂ¾Ã‘ ÃÂ¿ÃÂ¾ÃÂ´ÃÂ¸!- ÃÂ²ÃÂ¾Ã‘ ÃÂºÃÂ»ÃÂ¸ÃÂºÃÂ½Ã‘ ÃÂ» ÃÂ´ÃÂ¾ÃÂºÃ‘ ÃÂ¾Ã‘ .- ÃÂ¯ ÃÂ´ÃÂ¾ÃÂ»ÃÂ¶ÃÂµÃÂ½ Ã ÃÂ°Ã‘ ÃÂ¿Ã‘ ÃÂµÃÂ´Ã‘ ÃÂ¿Ã‘ ÃÂµÃÂ´ÃÂ¸Ã‘ Ã‘ , Ã‘ Ã‘ ÃÂ¾ ÃÂ»Ã‘ ÃÂ±ÃÂ°Ã‘ ÃÂ°ÃÂºÃ‘ ÃÂ¸ÃÂ²ÃÂ½ÃÂ¾Ã‘ Ã‘ Ã‘ ÃÂ² ÃÂ¿ÃÂ¾Ã‘ Ã‘ ÃÂµÃÂ»ÃÂ¸ ÃÂ¼ÃÂ¾ÃÂ¶ÃÂµÃ‘ Ã‘ Ã‘ ÃÂ°Ã‘ Ã‘ Ã‘ ÃÂ¼ÃÂµÃ‘ Ã‘ ÃÂµÃÂ»Ã‘ ÃÂ½ÃÂ¾ÃÂ¹.- Ã Ã‘ Ã‘ Ã‘ ÃÂ¾ ÃÂ¶ÃÂµ, Ã¢ Ã‘ ÃÂºÃÂ°ÃÂ·ÃÂ°ÃÂ» ÃÂ¼Ã‘ ÃÂ¶Ã‘ ÃÂ¸ÃÂ½ÃÂ°, Ã¢ ÃÂµÃ‘ ÃÂ»ÃÂ¸ ÃÂ¾ÃÂ½ÃÂ° Ã‘ ÃÂ¼Ã‘ ÃÂµÃ‘ , ÃÂ·ÃÂ½ÃÂ°Ã‘ ÃÂ¸Ã‘ , ÃÂ¾ÃÂ½ÃÂ° Ã‘ ÃÂ¼Ã‘ ÃÂµÃ‘ Ã¢ Â¦I first learnt German by telling jokes to people in my awful German. But I quickly progressed and now IÃ¢ m pretty fluent Ã¢ and know lots of great jokes as well. When youÃ¢ re trying to improve your skills in a foreign language, reading is one of the best ways Ã¢ and reading jokes is probably the best of all. The best way to use this book is to treat it like a swimming pool on a warm day. Dip in now and again and it is a very pleasant experience. If you stay in too long you wonÃ¢ t enjoy it as much. In case youÃ¢ ve forgotten, 10 good reasons for downloading Ã ÃÂ½ÃÂ¸ÃÂ³ÃÂ° Ã‘ Ã‘ Ã‘ ÃÂ¾ÃÂº ÃÂ¿ÃÂ¾-ÃÂ°ÃÂ½ÃÂ³ÃÂ»ÃÂ¸ÃÂ¹Ã‘ ÃÂºÃÂ¸ ÃÂ¸ ÃÂ¿ÃÂ¾-Ã‘ Ã‘ Ã‘ Ã‘ ÃÂºÃÂ¸.It improves your reading skills.It improves your spelling Ã¢ and your writing.It will give you some interesting new vocabulary.Jokes are short Ã¢ and you will be rewarded with a laugh (or a groan).Jokes are memorable Ã¢ so you can tell your friends the jokes later.If youÃ¢ re a teacher, you can entertain your students.If youÃ¢ re a student, you can entertain your teachers.ItÃ¢ s available in a wide variety of formatsItÃ¢ s available from a wide variety of suppliers so you can choose.It is a GREAT way to improve your English Ã¢ or Russian.